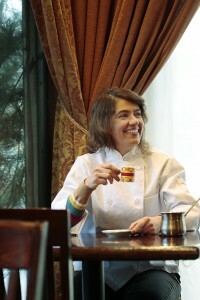 Mirna Attar, chef and owner of Ya Hala restaurant, came to Portland from Lebanon when she was 18. Three years into a fine art degree at PSU, Mirna got sidetracked, married and started a family. While home with her three young children, Mirna found her passion and spent all her free time cooking. She immersed herself in as many cookbooks as she could; the more complicated the recipe, the better! In 1994, Mirna and her husband bought a Lebanese grocery store in the Montavilla neighborhood of Portland. The store had four tables, and since Mirna’s kids were a bit older, she decided to cook meals for the shoppers. Within a couple of weeks there were lines out the door for her outstanding Lebanese cuisine. To accommodate their rapidly growing clientele, the Attars moved their grocery store next door, renovated the existing space and named it Ya Hala (which means “welcome” in arabic). There Mirna serves true Lebanese home-cooking; the kind of food you’d eat if you were lucky enough to be invited to a friend’s home in Lebanon. And not only does Mirna cook for her guests, she continues to cook for her extended family every day, too! In addition to Ya Hala, the Attars own Barbur World Foods, one of Portland’s best international food stores. Barbur has products impossible to find anywhere else in town, and John (Mirna’s husband) is the ultimate host. It’s not unusual for him to take you for a tour around store while introducing you to some of his favorite childhood treats. Mirna supervises the outstanding deli counter, serving up pita made to order and the most divine baba ghanouj, roasted lamb leg and other Lebanese delicacies. Mirna’s three children are now grown and help out in the restaurant on weekends when they’re not in school or at work. The Attar family is very involved in their community, and donates their time and services to organizations around Portland. Mirna’s first love is baking (as you can taste from her shredded filo and custard dessert on our M.O.M. menu this month), but truthfully, her Lebanese food is as good as it gets.